Nikki Sixx is reflecting on the end of Motley Crue as he moves forward with his band Sixx:A.M.
Sixx and Motley Crue wrapped up their farewell tour at the Staples Center in Los Angeles on New Year’s Eve, bringing an end to the group’s 35-year career. “When we played at The Starwood on January 17, 1981, nobody cared. We couldn't get a record deal. And I'd say we couldn't get arrested, but actually, the only thing we could get was arrested. Our first show ended in a fistfight in the audience, and it wasn't the band fighting each other; it was the band fighting people that were messing with us. And that was the heart and spirit of that band. Sixx reveals he moved on to a new future once the final show ended. The bassist maintains Motley Crue went out on top instead of with a whimper. "I'm not sad. I'm not sad at all,” Sixx adds. “I'm proud. I'm happy. I would have been sad if we would have stayed together another ten years and I would have been in here talking to you, and you go, 'So, tell me how it's going.' 'Well, I'm playing the rib joint down the street with just… only me and the band. And it's called Motley Crue III or something.' I like integrity. I'd really rather go out on my feet than my knees." 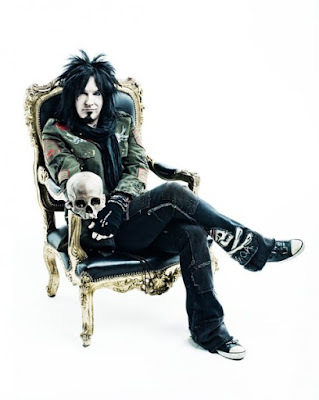 The rocker is gearing up for the April 29 release of Sixx:A.M.’s fourth project, “Prayers For The Damned”; it’s the first volume of a double album project that will see both records issued this year.